You are only 1 step away from enjoying a delicious Piero's pizza! And you have managed to prepare an authentic Piero's pizza in your own kitchen at home. On this page Piero explains how to bake the pizza. 1. The oven is still on. If not, set it to the maximum temperature. 2. Bake the pizza for no longer than 9 minutes. 3. Remove the pizza from the oven, close the oven and turn it off. This baking process will cost you approximately US $ 0.08 energy. Aren't 9 minutes awfully short for a deep pan pizza? Click here to learn more about the baking duration. Your pizza is already done. The dough had enough time to sit and rise and by step (4) you have baked the dough to a degree where it is done (but not crispy). This is where a Piero trick comes in: On an authentic Piero's pizza the toppings must not burn or overcook. This is why the second baking process is so short. It is just long enough to make the outer edge and bottom of the dough crispy while it leaves the toppings fresh & moist. For the same reason real Italian pizzas get their toppings only after baking: ingredients like rocket are far too sensitive to be baked! Never longer than 9 minutes! 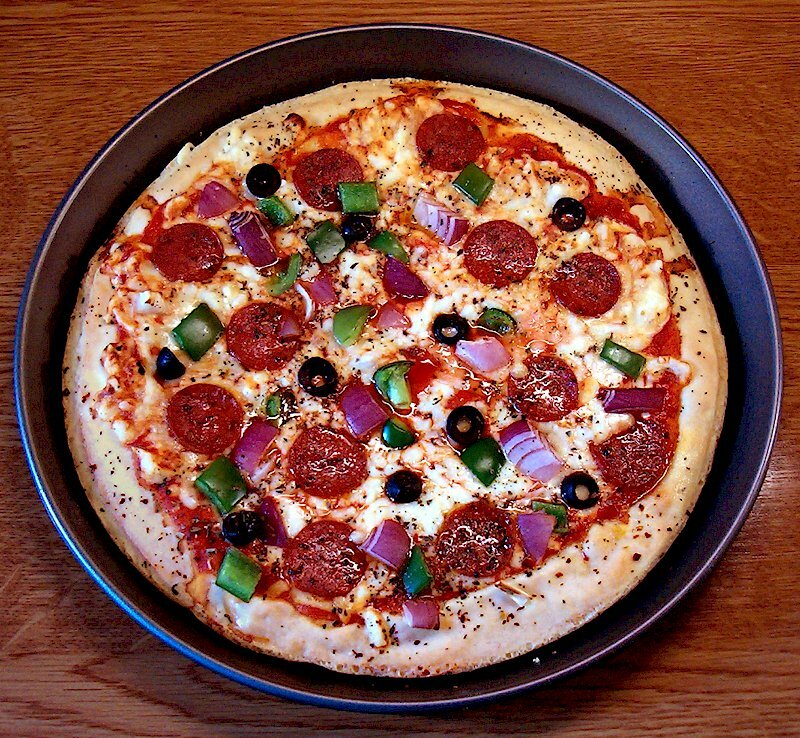 If you have prepared the pizza correctly the pizza dough will long be done before you add the toppings. 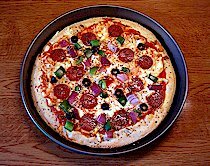 Do not leave the pizza in the oven for more than 9 minutes because otherwise the dough will become hard and dry, the toppings will burn, the flavor will become bitter and the individual flavors will blend. This will result in a bad pizza that tastes gray & bitter.